something delicious to fortify you for whatever is to come right? still one of my missions. pleasure to work with and I am chuffed to be working with them again this year. totally honest this is another semi-check. and I love my new look up, down, and sideways! see small bubbles form on the sides. Add the tableas and stir until most of it is melted. thickened and cooked to your liking. Maybe another 10 minutes. Sweeten to taste with the muscovado. – Serve warm topped with chopped cashews. universe shamed me into doing them. subasta and the muscovado I used for this oatmeal are locally sourced and sold in one of my favorite shops. to share this all with you! Avoiding food waste – The fight against food waste continues! book), in fact, rock niceness! Connect. is free and totally in your power to achieve! Just in case you were wondering, the oatmeal turned out lovely — super creamy and deeply chocolate-y, thanks to the earthy quality of the cacao. The coconut milk provided a robust, yet not too assertive, base. Very luxurious, yet homey too. If you don’t have access to Filipino tablea you can use a similar amount of unsweetened chocolate. OMG, what a decadent dessert! That oatmeal looks really scrummy. Well done on your goals for last year! Wish I could say the same..lol.. Well in all fairness to myself I have achieved some of my goals but not all so those are back on the list for this year. 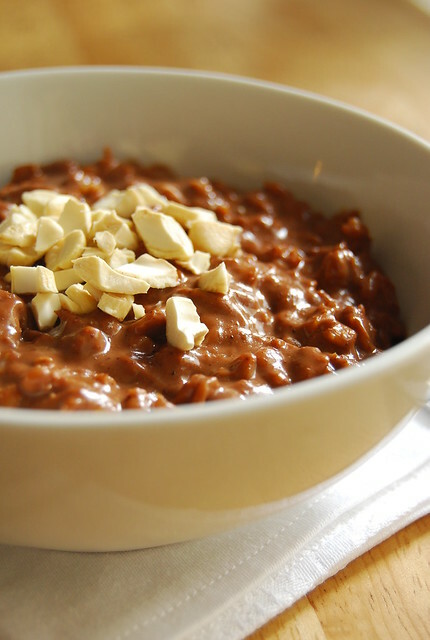 love the look of this choco oatmeal! Hi Gio! This would be perfect on a rainy morning! I am very fond of oatmeal 🙂 Aside from coconut milk, you can also try cooking it in carabao's milk…now that's luxurious! This is the sort of dish that would convert my husband who thinks oatmeal is much too healthy for anything but cookies 🙂 Wishing you and your family the best in 2012! Are you sure this is for breakfast? It´s so decadent that I could have it for dessert. Great recipe. Mmm.. looks super yummy, I think I may add a little flax and ground almonds to mine! Brava on accomplishing so much of your goals for last year! I wish I could say the same for myself but I am forever an optimist and will keep trying. It's such a pleasure reading your blog and your Yummy column! I look forward to picking up the new issue and checking out your new layout. Hi Weekend Gourmet! I love oatmeal and plan on converting the world! All the best to you in 2012 as well! Hi Jenetta! That sounds good…you can adjust this to suit your taste! Hi Shalum! Happy new year to you as well!! Oh wow, that looks so delicious!! I need to make it 🙂 All the best to you in this new year! All the very best for 2012 Joey. Chocolate makes it all so decadent and this oatmeal looks incredible! Looking forward to 2012 with you! This oatmeal looks amazing and I’ve been inspired to feature it in my Friday Food Fetish roundup. And I'll be sharing on Pinterest. Please let me know if you have any objections and KEEP IT COMING! I am always looking for new ways to prepare oatmeal and this one is definitely going on the list! I love your idea of "directions" instead of "resolutions", sounds much more attainable. Happy New Year, all the best for 2012! Hi Berni! Hope you like it! Wishing you the best for 2012 as well! Hi Meeta! Looking forward to 2012 as well 🙂 And reading more of your delicious posts! Hi Anh! Oh you are too sweet and kind! All the best to you too! Hi Neilish! Glad to hear you enjoy the blog 🙂 Could you send your request to my email please (it’s on the sidebar)? That oatmeal looks fantastic and will hopefully bring life (and color) to my boring breakfast staple. Hi Joey! Do you think this would work with steel cut oats too? This looks great! Hi lazyblackcat! Glad you think so 🙂 I love oatmeal and do my best to make it yummy for the rest of the world! This is so yummy! This reminds me of the champorado my mom used to make for me when I was a kid. Thank you for sharing!